The OME element is a container for all information objects accessible by OME. and the analysis results themselves. An OME file may contain any or all of this information. the top level OME node has changed slightly. its Metadata Only Companion OME-XML file. and preferably its full version. writing out OME-XML from scratch. This unique identifier is used to keep track of multi part files. It allows the links between files to survive renaming. MetadataOnly Companion to a collection of BinaryOnly files. The rights holder of this data and the rights held. e.g. "Copyright (C) 2002 - 2016 Open Microscopy Environment"
e.g. "All rights reserved" or "Creative Commons Attribution 3.0 Unported License"
The Project ID is required. 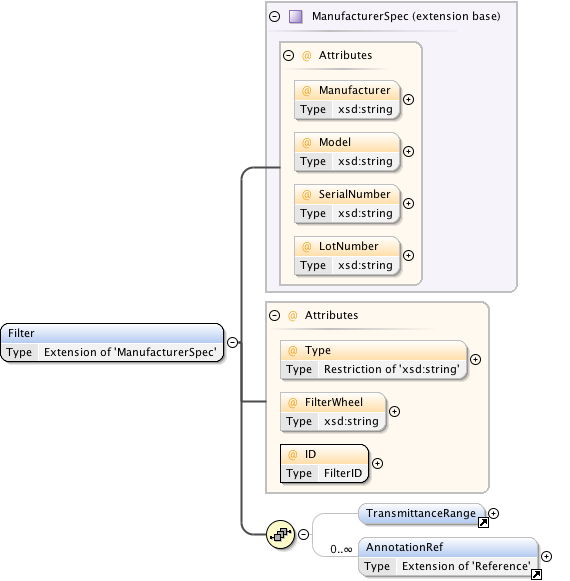 Datasets can be grouped into projects using a many-to-many relationship. 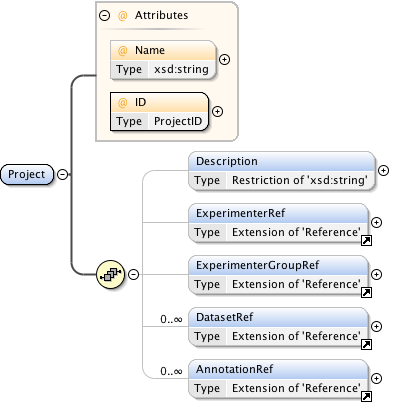 A Dataset may belong to one or more Projects by including one or more ProjectRef elements which refer to Project IDs. Projects do not directly contain images - only by virtue of containing datasets, which themselves contain images. 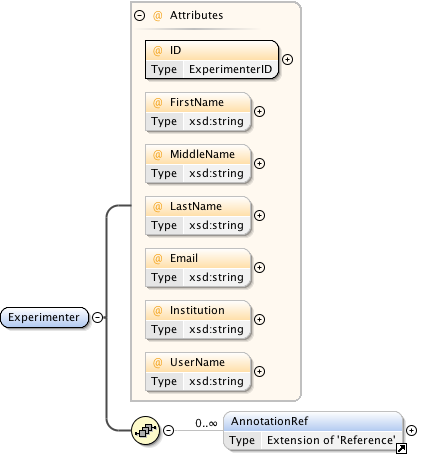 This empty element has a required Experimenter ID and an optional DocumentID attribute which refers to one of the Experimenters defined within OME. 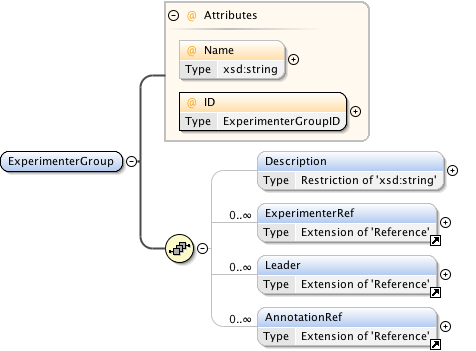 This empty element has a reference (the ExperimenterGroup ID attribute) to a ExperimenterGroup defined within OME. 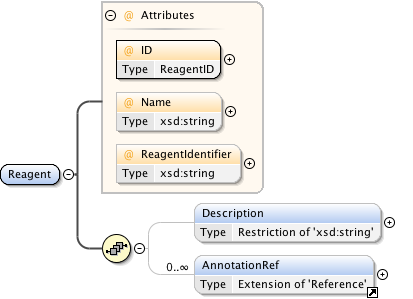 The DatasetRef element refers to a Dataset by specifying the Dataset ID attribute. An element specifying a collection of images that are always processed together. Images can belong to more than one Dataset, and a Dataset may contain more than one Image. 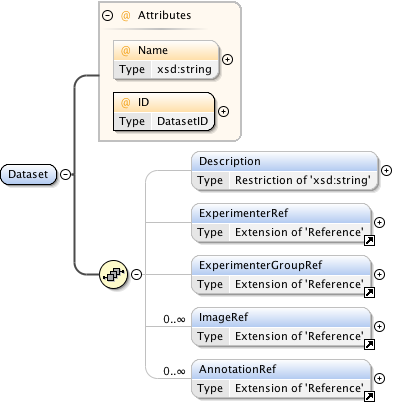 Images contain one or more DatasetRef elements to specify what datasets they belong to. Once a Dataset has been processed in any way, its collection of images cannot be altered. 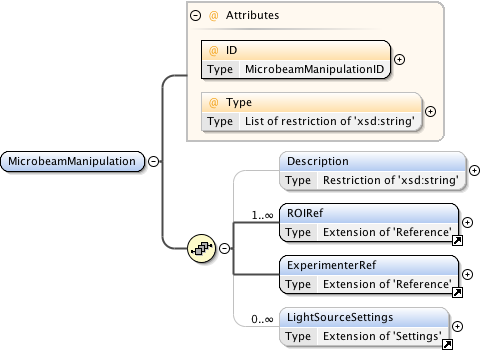 The ExperimenterRef and ExperimenterGroupRef elements specify the person and group this Dataset belongs to. Projects may contain one or more Datasets, and Datasets may belong to one or more Projects. 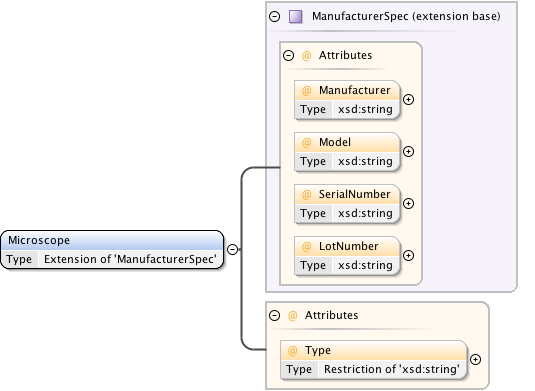 This relationship is specified by listing DatasetRef elements within the Project element. A name for the dataset that is suitable for presentation to the user. The ImageRef element is a reference to an Image element. 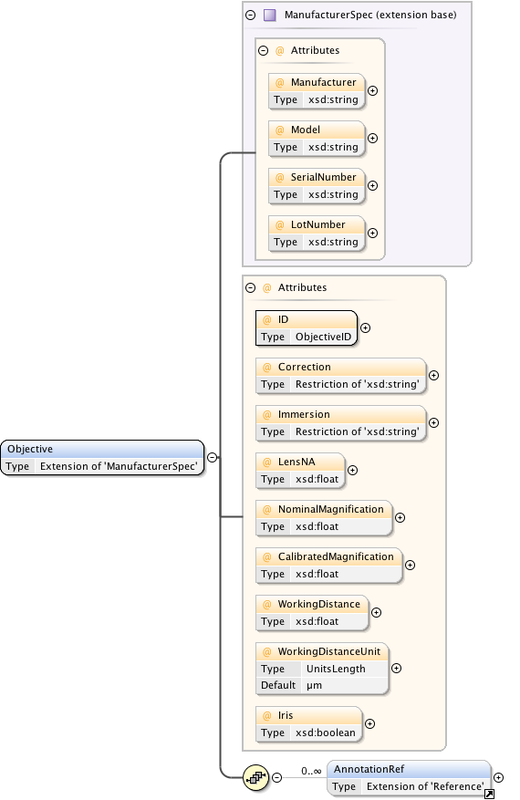 An element specifying a possibly heterogeneous collection of data. Folders may contain Folders so that data may be organized within a tree of Folders. Data may be in multiple Folders but a Folder may not be in more than one other Folder. A name for the folder that is suitable for presentation to the user. 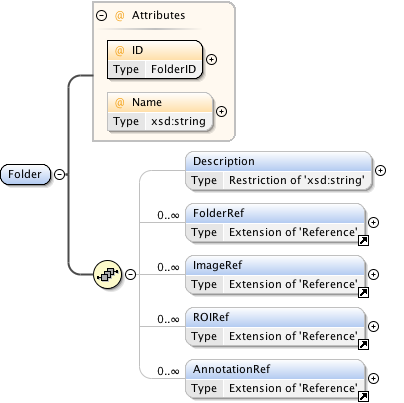 The FolderRef element refers to a Folder by specifying the Folder ID attribute. the Folder contains. This tree hierarchy must be acyclic. FP refers to fluorescent proteins, PGI/Documentation is not a 'data' image. 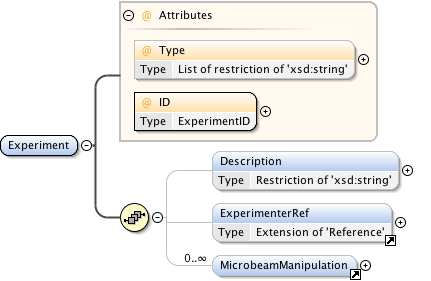 The optional Description element may contain free text to further describe the experiment. A term to describe the type of experiment. Defines a microbeam operation type and the region of the image it was applied to. the purpose of imaging. For example, a laser used for photobleaching. The type of manipulation performed. A fraction, as a value from 0.0 to 1.0. The Wavelength of the light source. 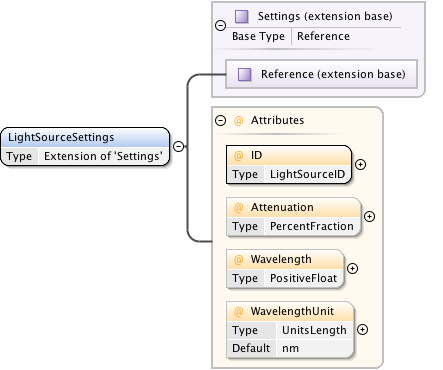 Units are set by WavelengthUnit. This element identifies microtiter plates within a screen. A plate can belong to more than one screen. The Screen(s) that a plate belongs to are specified by the ScreenRef element. The Plate ID and Name attributes are required. The Wells in a plate are numbers from the top-left corner in a grid starting at zero. 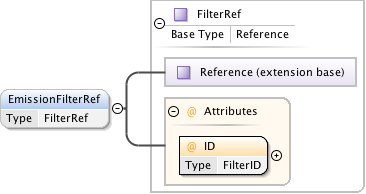 The ExternalIdentifier attribute may contain a reference to an external database. The Name identifies the plate to the user. 1. If name is available use it. 2. If not use "Start time - End time"
3. If these times are not available use the Plate ID. 1. Seed cell: done; 2. Transfection: done;      3. Gel doc: todo. in the plate has the same well origin. Units are set by WellOriginXUnit. in the center of the view. 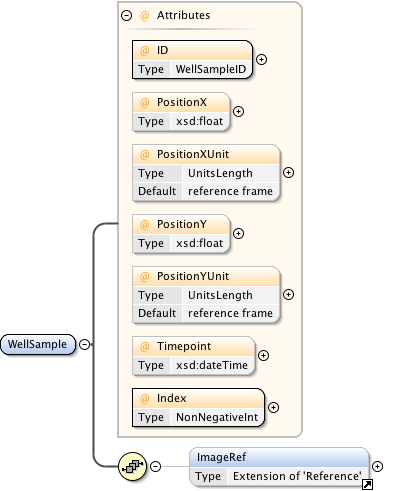 The units of the well origin in X - default:reference frame. in the plate has the same well origin. Units are set by WellOriginYUnit. The units of the well origin in Y - default:reference frame. A description for the plate. A Well is a component of the Well/Plate/Screen construct to describe screening applications. A Well has a number of WellSample elements that link to the Images collected in this well. The ReagentRef links any Reagents that were used in this Well. A well is part of only one Plate. The origin for the row and column identifiers is the top left corner of the plate starting at zero. NOTE: Prior to the 2012-06 schema the default value was incorrect and produced a transparent red not solid white. The combination of Row, Column has to be unique for each well in a plate. A description of the externally defined identifier for this plate. A human readable identifier for the screening status. e.g. empty, positive control, negative control, control, experimental, etc. WellSample is an individual image that has been captured within a Well. of PlateAcquisitions for the plate. the well origin defined on the Plate. Units are set by PositionXUnit. The units of the position in X - default:reference frame. the well origin defined on the Plate. Units are set by PositionYUnit. The units of the position in Y - default:reference frame. 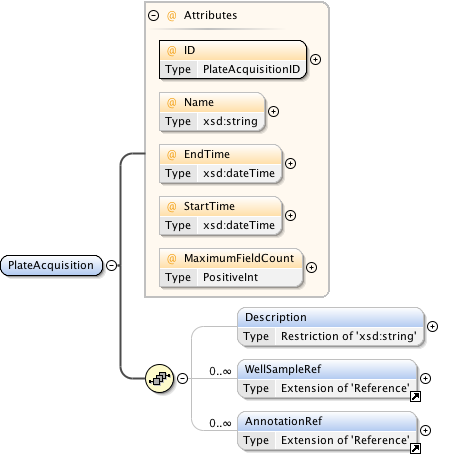 PlateAcquisition is used to describe a single acquisition run for a plate. the reading of every well sample. A description for the PlateAcquisition. 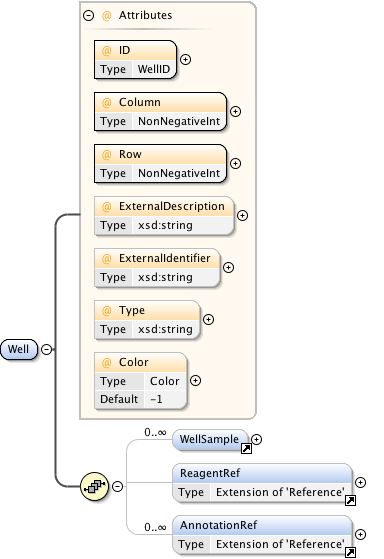 The WellSampleRef element is a reference to a WellSample element. The Screen element is a grouping for Plates. The required attribute is the Screen's Name and ID - both must be unique within the document. 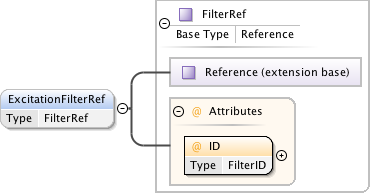 The Screen element may contain an ExternalRef attribute that refers to an external database. A description of the screen may be specified in the Description element. Screens may contain overlapping sets of Plates i.e. Screens and Plates have a many-to-many relationship. Plates contain one or more ScreenRef elements to specify what screens they belong to. reproduce some of that found in a screening database. 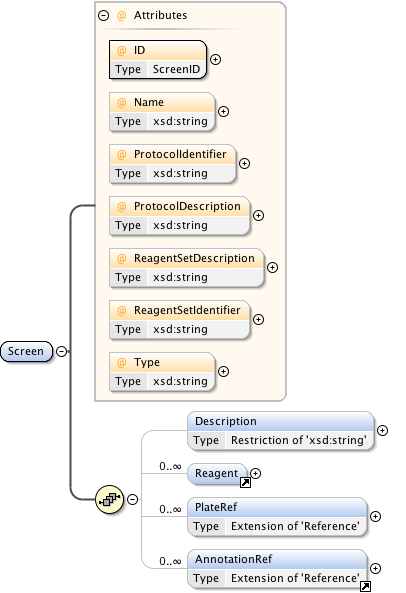 A pointer to an externally defined protocol, usually in a screening database. reproduce some of that information found in a screening database. A human readable identifier for the screen type; e.g. RNAi, cDNA, SiRNA, etc. This string is likely to become an enumeration in future releases. A description for the screen. Reagent is used to describe a chemical or some other physical experimental parameter. This is a reference to an external (to OME) representation of the Reagent. It serves as a foreign key into an external database. - It is sometimes referred to as ExternalIdentifier. A long description for the reagent. The PlateRef element is a reference to a Plate element. Screen elements may have one or more PlateRef elements to define the plates that are part of the screen. Plates may belong to more than one screen. This element describes a person who performed an imaging experiment. This person may also be a user of the OME system, in which case the UserName element contains their login name. Experimenters may belong to one or more groups which are specified using one or more ExperimenterGroupRef elements. The organizing structure that people belong to other than groups. A university, or company, etc. We do not specify a department element, and do not mean for Institution to be used in this way. Information should ideally be specified for at least one Leader as a contact for the group. The Leaders are themselves Experimenters. to an Experimenter element defined elsewhere in the document. This element describes the instrument used to capture the Image. The Objective element contains the additional elements LensNA and Magnification. emission filters and a dichroic mirror or a single filter set. Within the Image itself, a reference is made to this one Filter element. 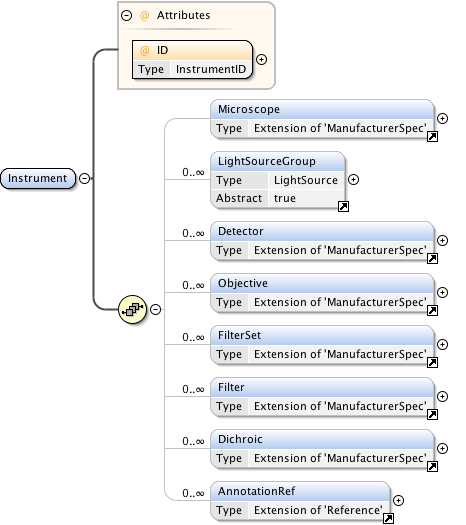 There may be multiple light sources, detectors, objectives and filters on a microscope. Each of these has their own ID attribute, which can be referred to from Channel. each plane of an XYZ stack. 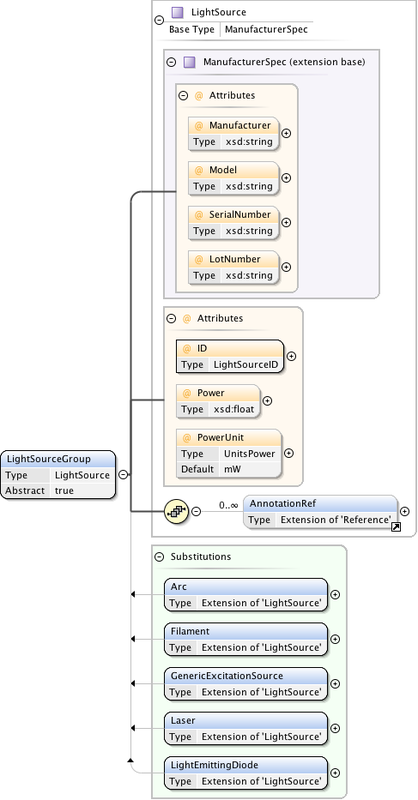 light sources can be referred to by their LightSource IDs (eg from Channel). The light-source power. Units are set by PowerUnit. The units of the Power - default:milliwatts[mW]. The type of detector used to capture the image. 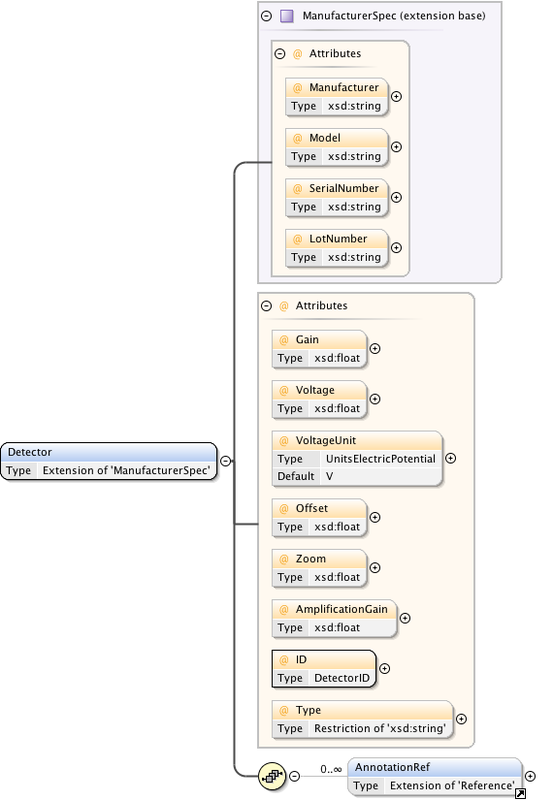 The Detector ID can be used as a reference within the Channel element in the Image element. possibly splitting this object into sub-types. Gain applied to the detector signal. The Type of detector. E.g. CCD, PMT, EMCCD etc. Units are set by VoltageUnit. The units of the Voltage - default:volts[V]. A description of the microscope's objective lens. Correction: This is the type of correction coating applied to this lens. single type) as here Immersion can have compound values like 'Multi'. WorkingDistance: WorkingDistance of the lens. The numerical aperture of the lens expressed as a floating point (real) number. The working distance of the lens expressed as a floating point (real) number. Units are set by WorkingDistanceUnit. The units of the working distance - default:microns[µm]. The Filters placed in the Excitation light path. The Filters placed in the Emission light path. A filter is either an excitation or emission filters. There should be one filter element specified per wavelength in the image. The channel number associated with a filter set is specified in Channel. 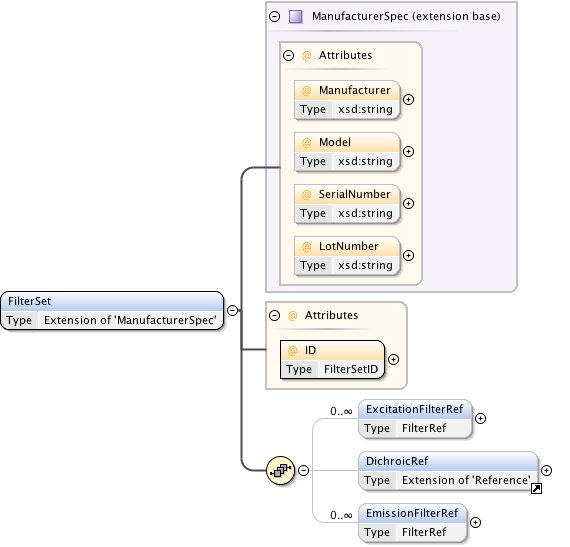 It is based on the FilterSpec type, so has the required attributes Manufacturer, Model, and LotNumber. 'Dichroic', 'NeutralDensity', 'Tuneable' or 'Other'.